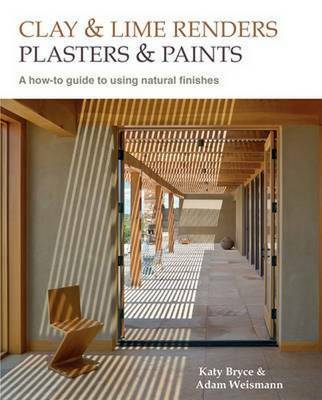 Clay & Lime Renders, Plasters & Paints is a step-by-step guide to applying natural finishes. The Clay & Lime Renders, Plasters & Paints book is about using materials that are defined as being ‘natural’ because they have undergone minimal processing, and contain no synthetic ingredients. The finishes described in the book are plasters, renders, paints and washes. The raw materials – lime and earth – are versatile and adaptable. They have been used for thousands of years, throughout the world. They have been used simultaneously for the building of the wealthy and the buildings of ordinary folk. Step-by-step instructions for applying lime and clay based plasters, renders and paints. Information on the benefits of natural finishes for personal health, the environment and buildings. Drawing on traditional methods and materials for using lime and clay finishes on new and historic buildings. Design details for using natural finishes to create healthy and eco-friendly homes and buildings. A comprehensive and up-to-date online resource guide to suppliers, practitioners and courses. ‘This highly informative and sumptuous book shows how the threat of climate change is also an opportunity to make buildings more beautiful.’ Sunand Prasad – former President of the Royal Institute of British Architects (RIBA). ‘A splendid book. A real addition to what’s out there and very complementary to the Society for the Protection of Ancient Buildings’ technical manual on Old Building Repairs.’ Kevin McCloud – presenter of Grand Designs. ‘This book demonstrates a level of professionalism and aesthetic sensibility that is a very valuable contribution to knowledge in the field.’ Tom Woolley – architect and Professor at the Graduate School of the Environment, Centre of Alternative Technology, Wales. ‘Adam and Katy are rethinking how we build, and coming up with something beautiful.’ John Vidal – Environment Editor of The Guardian.